The Hobbit: The Battle of the Fives Armies is the final installment in The Hobbit Trilogy, as well as finishing off director Peter Jackson's Middle-earth movies (at least for now). There are some mild spoilers in this beginning paragraph but they take place in the very beginning and are nothing different than what happened in the book, so if you are super against spoilers, skip this paragraph. The movie opens right where The Desolation of Smaug left off. Smaug (Benedict Cumberbatch) is headed straight for Lake Town. Bard (Luke Evans) is imprisoned. 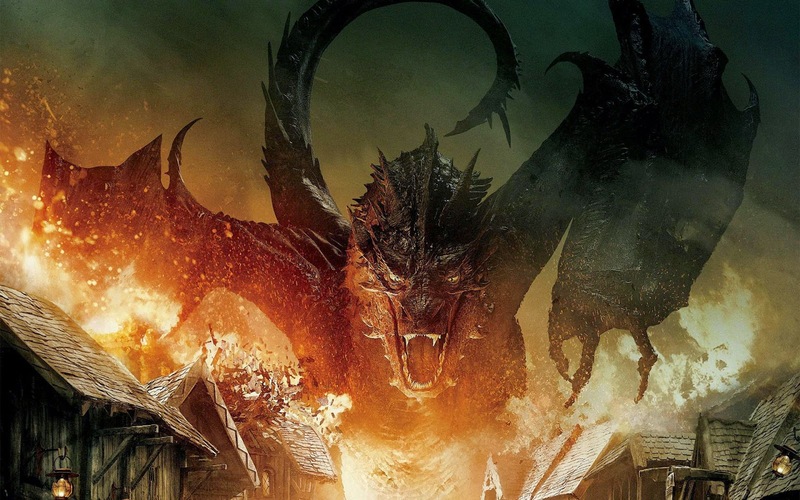 Smaug begins to destroy the town, unleashing hell on it. Bard is then able to take the black arrow and kill Smaug. Again, all of this happens in the first ten minutes of the movie (before the title even appears), so it's not really a spoiler. Then the movie begins. While I loved the cliffhanger ending of the second film, having Smaug's death in the beginning of this film felt out of place. Perhaps it was because it was so short. The extended edition comes out some point next year, so maybe that sequence will be expanded upon. The film then shifts focus to preparing for battle. Thorin (Richard Armitage) is now king under the mountain, but has fallen to "dragon sickness", the same illness that plagued this grandfather, Thror. Thorin has become obsessed with the fortune, and it has clouded his judgment. Jackson did this part so brilliantly, because they muffled Thorin's voice so that is was much deeper, to the point where it mimicked Smaug's voice. They showed the comparison between Thorin's obsession and that of the dragon's, which I thought was very well done. After the destruction of their town, the Lake men wash up on the banks and take refuge in Dale, where they plan to have Thorin honor his word in Desolation, that he would give them a portion of the gold. However, by the next morning, the Wood-Elves have gathered too, planning to go to war with the Dwarves to get the silver gems Thranduil (Lee Pace) desired in the previous films. Bard, however, convinces Thranduil to hold off on the war so that they can perhaps reason with Thorin. However, Thorin, consumed with dragon sickness, refuses them and instead wishes to go to war. At the same time, Gandalf (Ian McKellen) is still trapped in Dol Guldur, leaving off of the previous film. There, he is rescued by Galadriel (Cate Blanchett) but is confronted by the nine Ringwraiths. Elrond (Hugo Weaving) Saruman (Christopher Lee) and Radagast (Sylvester McCoy) show up and fight off the Ringwraiths. Sauron himself then shows up, but Galadriel is able to fend him off. While I loved this scene, it was much too short. It will most likely be expanded upon in the extended edition though. And maybe it was just the way the Ringwraiths were designed as spirits, but it literally looked like the actors were swinging their swords at nothing. That kind of took me out of the movie a bit, but it was a small problem. The battle itself is spectacular. 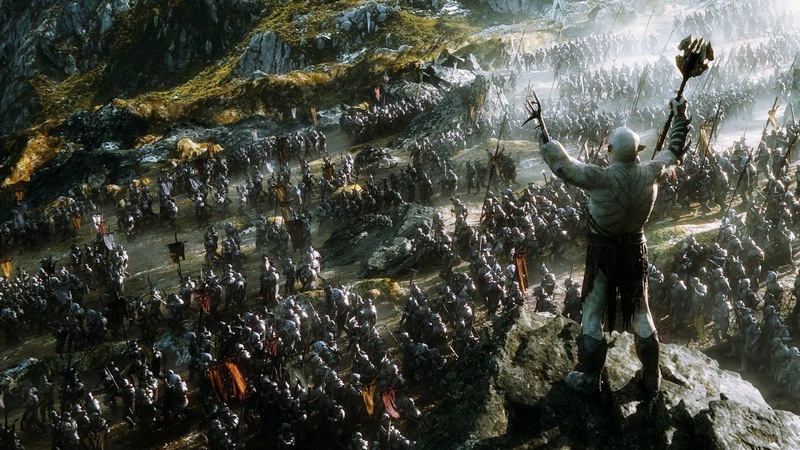 While it doesn't compare in quality to battles in The Lord of the Rings like Helm's Deep or Pelennor Fields, it is probably the biggest scale battle yet in Middle-earth. You had Elves and Dwarves teaming up against the oncoming Orcs, led by the trilogy's main antagonist, Azog (Manu Bennet). With them come Cave trolls and a breed of bats. The Cave trolls were used well and looked really cool but I didn't care for the bats. Mainly because they didn't really do anything in the film. They just flew around. That's pretty much it. The scale was gigantic. You had thousands of Orcs against thousands of Elves and Dwarves all fighting it out in this giant field outside Erebor. At the same time, the Orcs were attacking Dale, trying to get at the men and women of Lake Town hidden there. The main protagonists of the film were split up between these places. Bard was focused more in Dale while the Dwarves, Legolas (Orlando Bloom) and Tauriel (Evangeline Lily) were off in other places. A main criticism of the film I have is that it didn't do enough to let you know geographically where everything and everyone was. You would cut back and forth between these different people in different places, but it was hard to know exactly where all these different places were. It got confusing at certain times. And for a movie called "The Hobbit", the hobbit himself wasn't the focus. As the past few films have played out, we've seen Bilbo (Martin Freeman) step back as the trilogy's focus and Thorin step up. Bilbo had a key role in the film, especially surrounding the Arkenstone, but he was not the movie's lead. It's unequivocally Thorin, which I like. While I love Freeman as Bilbo, Thorin has a really interesting story and I'm glad the film's tell it so well. But, what would a Hobbit film be without some criticisms? Each of the movies have had different aspects that I have disliked, sometimes even hated, that had me asking "Why Peter Jackson? Why?!". However, this movie didn't have many. There were some scenes with Legolas where he did some very impossible things that was unnecessary, but there wasn't as many in this as the previous two films. My biggest complaint has to be that this movie cannot stand on its own as a movie. What all The Lord of the Rings and first two Hobbit films did so well that, while being apart of a trilogy, they were their own film. They had a set beginning, middle and end. This film didn't. It felt more like The Desolation of Smaug Part Two. It opened with the second film's ending, and the rest of the movie was the battle. It really wasn't its own movie. That didn't lessen my view of the movie, but it's harder to judge it as its own film when it really isn't. Overall, it's my personal favorite of the three Hobbit movies. It has a lot of really cool action scenes and gives us the biggest battle we've seen from Middle-earth to date. There are some really good performances from McKellen, Armitage, Freeman and Evans. While there are certain parts that could have been done better or that lacked substance, it was still a good, enjoyable movie and a solid end to the trilogy (I will always think of The Return of the King as the true send-off for the franchise). With the extended edition coming some point in 2015, maybe some of the problems I had will be fixed with approximately thirty more minutes added. What do you think? Did you see The Hobbit: The Battle of the Five Armies? Leave your review in the comments section below.